All sizes are nominal but can be altered to your specific requirements. All of our sheds are 6' tall at the eaves, 2" x 1 1/2" framing, with 3" x 2" floor runners and 3" x 2" door bracing. Roof boards are a chunky 5/8" (16mm) in thickness. Quality Heavy weight sheds for sale handcrafted the old fashioned way. Buy with confidence from a company that has now been established for over 36 years. Robust construction using thick cuts of timber. Upgrades include 3/4" (19mm) thick external grade ply floors. Also heavy duty claddings available including 5/8" (16mm) pressure treated shiplap, 3/4" (19mm) pressure treated loglap. All of our sheds are 6' tall at the eaves. Garden Sheds are manufactured by us in our own new modern factory. Sheds can be made to suit customer requirements i.e. double doors, extra single door or even moving the door to a side panel. Claddings are usually 1/2" (12mm) Shiplap, 5/8" (16mm) Pressure Treated Shiplap or 3/4" (19mm) pressure treated Loglap. These are nailed using collated ring galvanised nails. We deliver to most counties usually within 1-2 weeks. You can also simply order a building with us and collect it yourself. Tanalised pressure treated garden buildings will last longer and are now the popular choice. We have been offering Sheds for sale now for many years, Garden Sheds here on display, why not come and visit us to discuss your requirements, Garden Sheds for sale at very keen prices. Sheds are usually are of a standard size i.e 6' x 4', 7' x 5', 8' x 6', 10' x 6', 8' x 8', 10' x 8', 12' x 8', 12' x 10', 12' x 12', 13' x 12', but we can adjust these to your specification, i.e 9' x 7', 10' x 4', 12' x 5' (metric equivalent ). Sheds can be Apex or Pent roof styles (Pent at an extra cost). Sheds can be supplied with Tanalised Pressure Treated Bearers if required. Sheds can also be made incorporating paper lining as an upgrade. Sheds can be preserved and water proofed using good quality products. Sheds for sale using heavy duty framings and claddings. Sheds for sale with partitions, and extra doors to create two in one buildings if required. Timber and Claddings for sale for D.I.Y projects, with discounts on large orders. Timber Sheds can be upgraded to include 3/4" Exterior Grade Ply Floors with extra floor runners if required. Shed making materials always for sale including framing, claddings and OSB sheets. 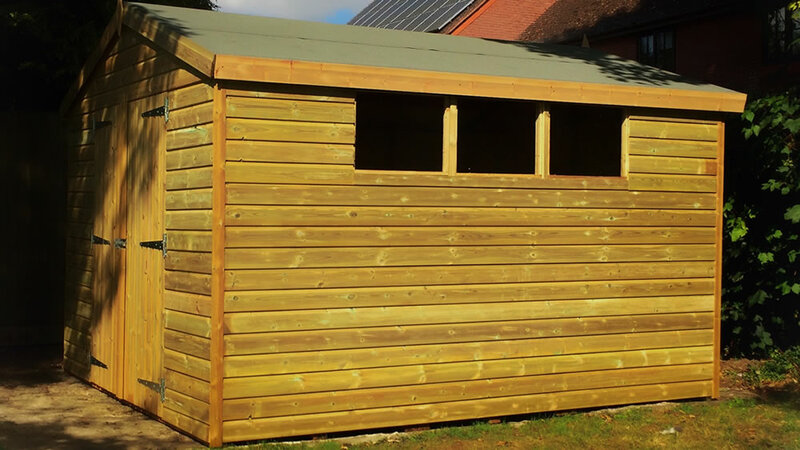 Field Shelters , Stables , Hay Stores , Tack Rooms , also manufactured at keen prices. Mobile Field Shelters and Mobile Stables , can also be made to order at very keen prices. Timber Garages , Timber Workshops , Summer Houses , can be made to order with various claddings. (A) Once your building is constructed you will need to water proof it. We can recommend a product called 'Stable Coat' available from Protek Products (Shepton Mallet) protekwoodstain.co.uk Tel: 01749 344697 (apply three coats). Even pressure treated timber will need coating with a water proofer to prevent dampness. We also recommend sealing up all joints with a waterproof mastic sealant. Timber being a natural product is subject to movement i.e, shrinkage, warping, splitting, knot holes etc may occur, therefore we cannot guarantee against this. (B) DELIVERY - Delivery where ever possible, and always at our drivers discretion. Abled body assistance will be required for off loading sections from within three metres of our delivery vehicle. If this is not possible please notify us where we can provide an additional helper, but at an extra cost. ASSEMBLY INSTRUCTIONS - All our buildings are supplied with roof felt. Please note: We strongly recommend using felt adhesive and felt tacks both together for securing down roofing felt (these we do not supply).